In a come-from-behind-victory, the Blue Devils walked away with the 2015 Drum Corps International World Championship title. It was quite an achievement for the Concord, California corps, after placing all the way down in fourth place due to a half-a-point warm-up penalty assessed during the group’s Prelims performance. 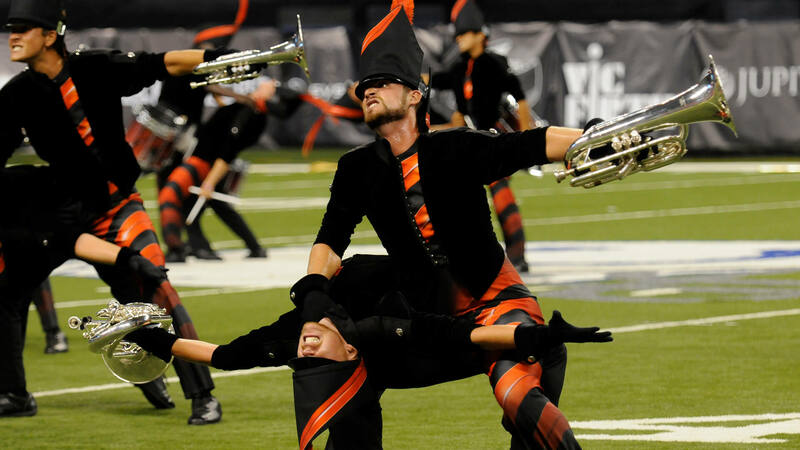 Similarly, Crossmen was almost knocked out of the Finals after a whopping 1.4-point penalty was assessed for going overtime during the corps’ Semifinals performance, resulting in a razor-thin finish less than a tenth over the 13th-place Troopers. 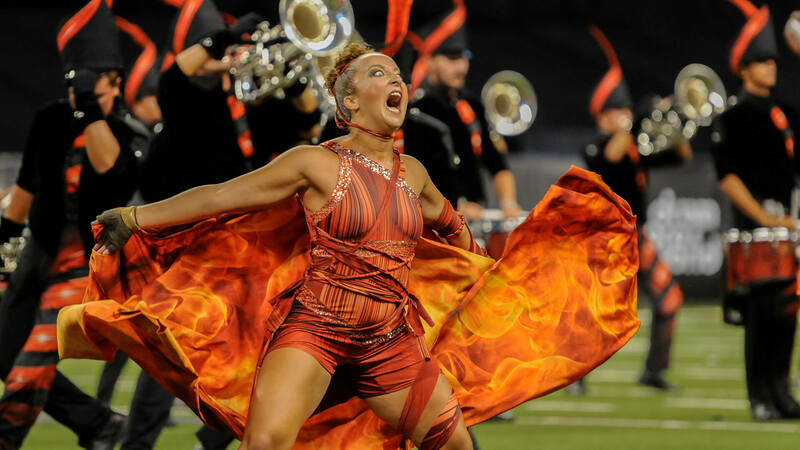 Own Carolina Crown's "Inferno" on Blu-ray disc. Many of Carolina Crown’s visuals were inspired by the iconic 1861 illustrations created for the epic poem by Gustave Doré, with red and black being the dominant colors in everything from the costuming of the color guard members to the corps’ uniforms and visual sets. The show started with the opening strains of the first movement of Ludwig van Beethoven’s “Symphony No. 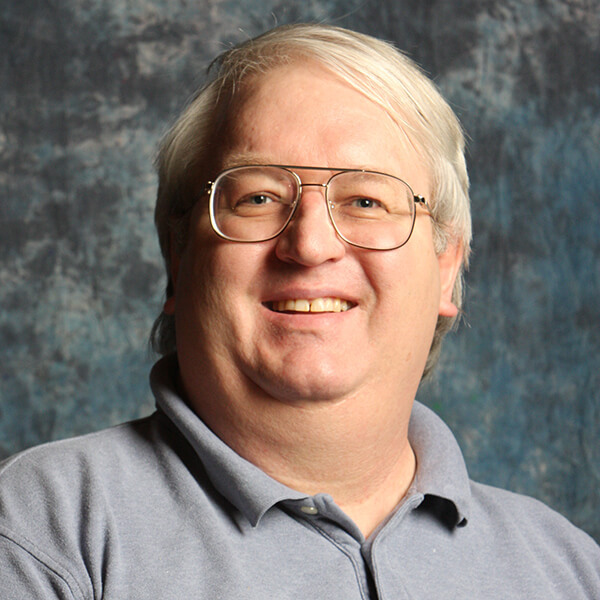 9,” which musicologists have often suggested sounds like an orchestra tuning prior to a performance. Crown designers mentioned the music and visuals—resembling people searching for meaning—at the beginning of this section was akin to starting out lost in the woods. Leading into a dramatic fanfare statement of the opening theme, things culminated with a 40-yard-wide black banner sailing over the entire corps. Emblazoned in red on the fabric was the proclamation, “Abandon all hope, ye who enter here,” which is the English translation of the supposed inscription over the Gates of Hell as envisioned by Dante. The members of the corps loudly and repeatedly vocalized that saying as they advanced out of a giant block triangle. 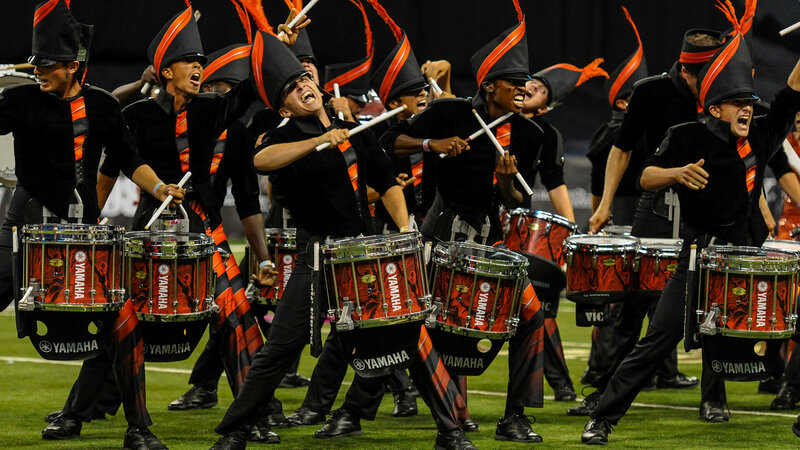 Corps arrangers Thom Hannum, Tony Nunez, Tom Aungst, and Steve Ridley composed the percussion feature titled “Gates of Hell.” Visually during this section the corps brought back a rotating prism effect first introduced in the corps’ “E=mc2” show of 2013. This percussion feature also offered the first appearance of the brass players forming nine small circles, a repeating visual device referencing Dante’s nine circles of Hell. Later seen in the “Dies Irae” and the Copland selections, the nine circles served to express the characterization of being in Hell. Furthermore, on the costumes of the brass players and percussionists were nine red rings starting in the lower leg and ascending to the top of their hats, with the lowest red ring on their pants fading into the ground and the feather atop the hats reaching up to Heaven. Next came the brutally intense “Dies Irae” from Italian opera composer Guiseppe Verdi’s “Requiem,” extracted from his 1874 setting of the Roman Catholic funeral mass he wrote in memory of his good friend, Italian writer Alessandro Manzoni. The title means “Day of Wrath” and is based on a Medieval Latin poem about the Day of Judgment, when the righteous will be saved and those not saved will be cast into the bowels of eternal damnation. Aaron Copland’s “Symphony for Organ and Orchestra” from 1924 followed, which is significant as the composer’s first orchestrated work, one that launched him on the road to fame. A raucous and ominous rendition of the upcoming “Ode to Joy” theme was heard as color guard members wrapped individual brass performers in flags of flaming orange. The guard members, acting as demons, threatened with provocative poses as another labored glimpse of the “Ode to Joy” theme brought the Copland work to a devastating close. A lone flugelhorn player performed the theme to Remo Giazotto’s “Adagio in G minor” while encased in a red veil that covered his head and most of his body, representing being face-to-face with Satan. Then a giant red scrim covered the entire horn line as they were figuratively swallowed up by Hell. A few tortured souls expressed their anguish through the scrim, with three managing to crawl out before unceremoniously being pulled back inside with the others. Seldom has such a lovely work been performed with such unforgiving angst. When a solo dancer ran to the flugelhorn soloist to pull off the red veil, the welcomed ascension to Heaven commenced. The closing of Crown’s “Inferno” was underscored musically with “Ode to Joy.” The final movement of Beethoven’s “Symphony No. 9” is one of the most glorious proclamations of optimism ever set to music. Long metallic gold streamers flew through the corps at the triumphant statement of the famed melody, followed by the appearance of the entire color guard spinning similarly-colored flags, belying the re-appearance of the nine circles in the horn line. In the blink of an eye, four horn players suddenly ran to four flagpoles, joined on either side by two field conductors, to pick up a giant gold and white banner that sailed over the entire corps. When the billowing silk cleared the front of the field, the brass players and percussionists were in the formation of the corps’ crown logo, surrounded by the color guard section. The form expanded outward to a larger crown as a large white scrim was spread out in the center front of the field. As a final punctuation mark on the corps’ epic production, a color guard member wearing a golden shawl ascended a white ladder out of the depths of Hell, climbing toward the glistening gates of paradise. Purchase this Blu-ray disc online today.